Readers Question: I’d like to ask you about routine ways (apart from so called “printing new money”) by which the total volume of money in the economy grows. The money supply measures the stock of money in the economy. A broad definition of money (M4) is notes and coins + deposits in bank accounts + other liquid assets. Print more money – usually, this is done by the Central Bank, though in some countries governments can dictate the money supply. For example in Zimbabwe 2000s – the government printed more money to pay wages. Quantitative easing The Central Bank can also electronically create money. Under a policy of quantitative easing, they decide to increase their bank reserves ‘effectively create money out of thin air’. The created money can be used to buy assets; the idea is to increase cash reserves of banks. Central Bank buying government securities. The Central Bank pays investors holding bonds. If the Central Bank buy Government securities (or corporate bonds) people who were holding the bonds have more money to spend. Banks see illiquid assets become liquid. Therefore, in certain circumstances, this can lead to an increase in the money supply. However, it depends on whether the bond purchases are sterilised or ‘unsterilised’. Unsterilised means they create money to buy bonds. Expansionary fiscal policy. In a recession, there is often a ‘paradox of thrift’ business and consumers want to increase savings – and this leads to a fall in spending and investment. If the government borrows from the private sector and spends on public work investment schemes then this will start a multiplier effect where households gain wages to spend and encourage private sector investment. Increased velocity of circulation. – The number of times cash changes hands. In practice, the link between money supply and inflation can be weak. One reason is that the velocity of circulation (number of times cash changes hands) is volatile – it tends to follow the business cycle. For example, in 2008, a recession in the US caused the velocity of circulation to fall and therefore money supply grew slower despite increases in the monetary base. In 2005-07, money supply was growing at between 10 and 15% a year. After the credit crunch and global recession, money supply growth became negative. 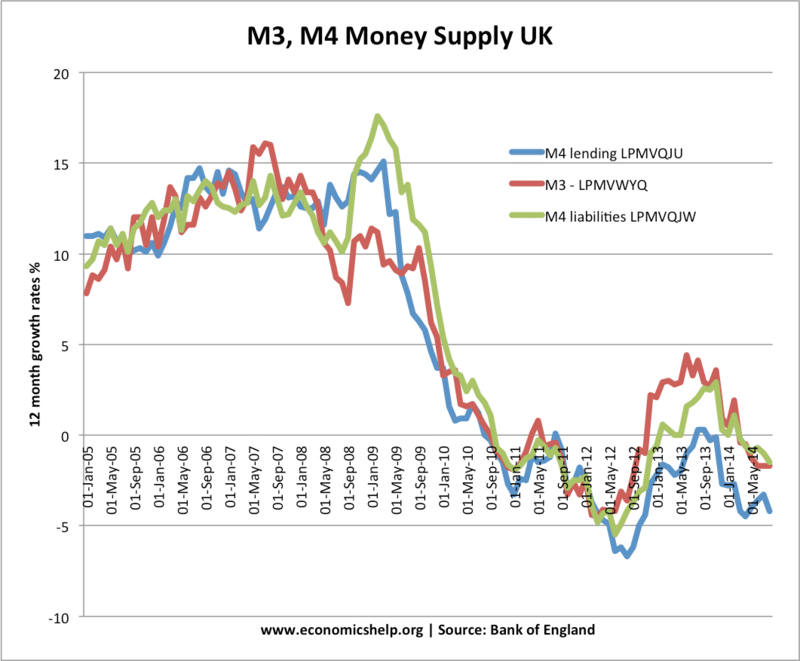 The fall in the money supply was due to a decline in bank lending as they sought to improve their position. Usually, an increase in the money supply will lead to a fall in interest rates. Lower interest rates will also increase investment, economic activity and inflation. 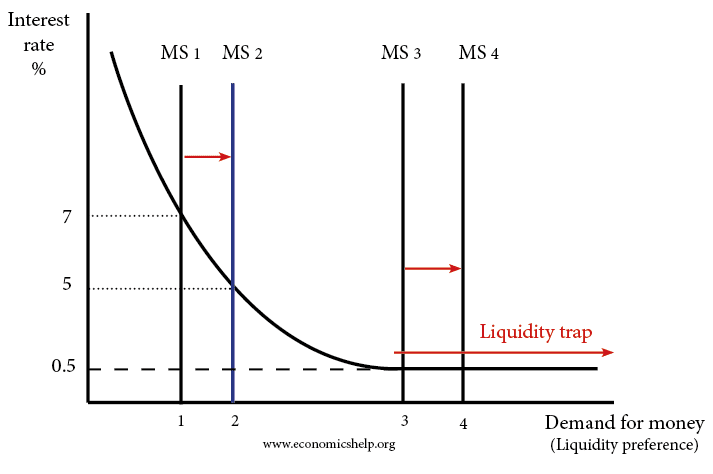 However, in a liquidity trap, an increase in the money supply may have no effect on reducing interest rates. i will try the level best to one of the anil ambani.